It’s very important that you take care of your horse in Red Dead Redemption 2, whether that is cleaning, feeding or patting it. If you don’t take care of your horse, it will lose it’s efficiency whether that is it’s stamina or health dropping. If you choose not to feed your horse especially, it will become malnourished and people will begin to judge you for it. Luckily, feeding your horse is a really easy task. You can buy provisions from the general store to feed your horse. Below, we have a guide for feeding your horse in Red Dead Redemption 2. Whilst we’ve covered more games for the guide available here. So there are actually two ways to feed your horse. One where you just feed a random item out of your inventory, and one where you actually choose the item. The second option is better if you need to restore some of the cores. To feed your horse quickly, walk towards it and hold L2 or Left Trigger. 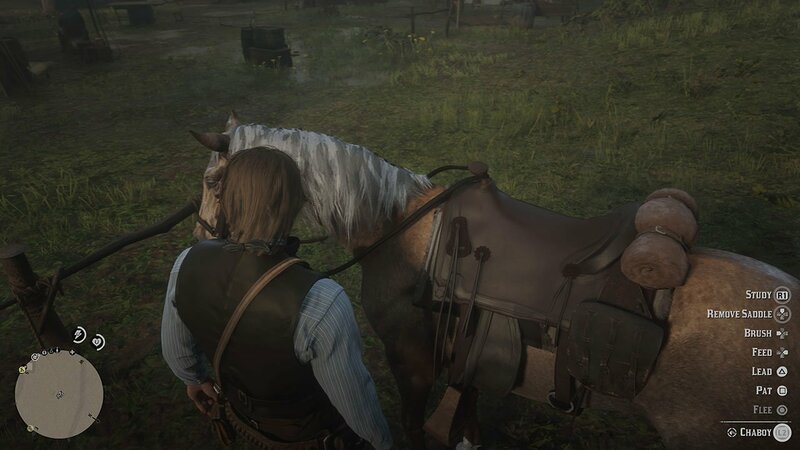 That way, you can interact with your horse. One of the options is ‘Feed’ by pressing thr Right D-Pad. Choose this option. Otherwise, you can ride your horse and access provisions manually. Whilst riding, hold down L1 to open your satchel and horse bags. You will see food items such as carrots which are extremely beneficial for your horse. You can also take a look at your health tonics to see which ones would benefit your horse. If you run out of provisions to feed your horse, head to any general store in town to buy more. They’re incredibly cheap, I also recommend purchasing some health tonics.